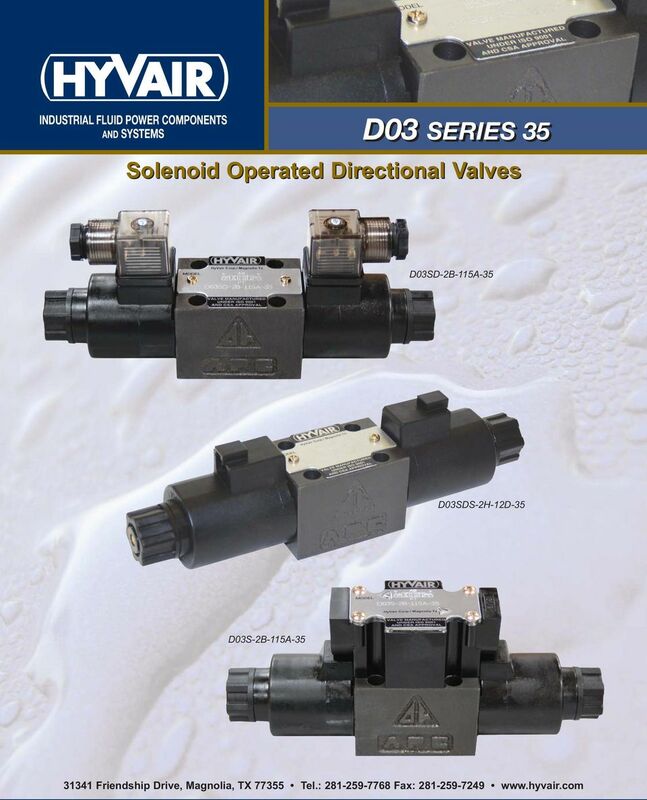 Download "Solenoid Operated Directional Valves"
2 Features High Flow/ High Pressure: Up to 25 gpm / 5000 psi working pressure*. Oil Immersed, Quiet Solenoid Design: Moving core immersed in hydraulic oil provides quiet operation. 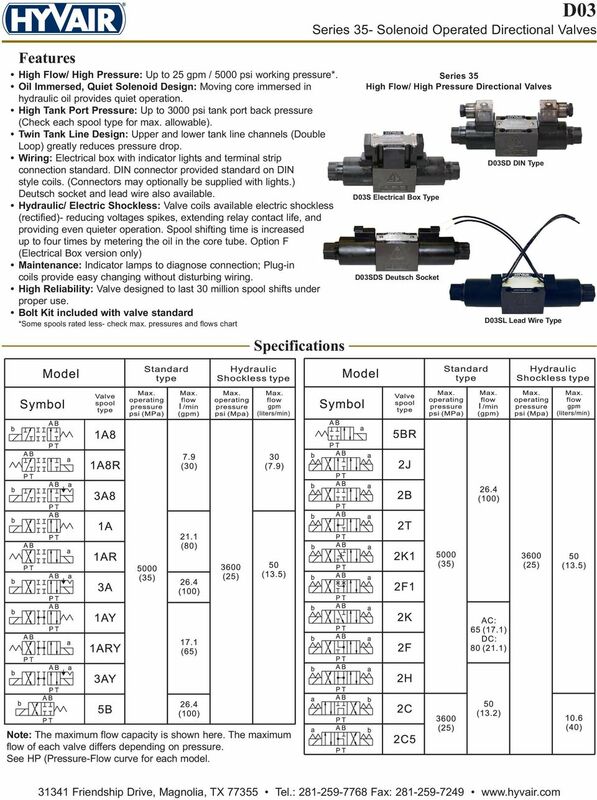 High Tank Port Pressure: Up to 3000 psi tank port back pressure (Check each spool type for max. allowable). Twin Tank Line Design: Upper and lower tank line channels (Double Loop) greatly reduces pressure drop. Wiring: Electrical box with indicator lights and terminal strip connection standard. 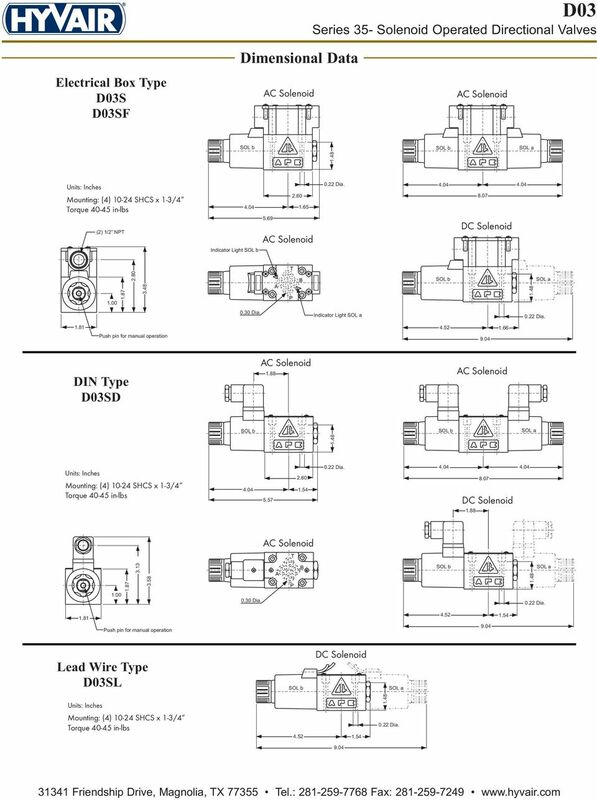 DIN connector provided standard on DIN style coils. 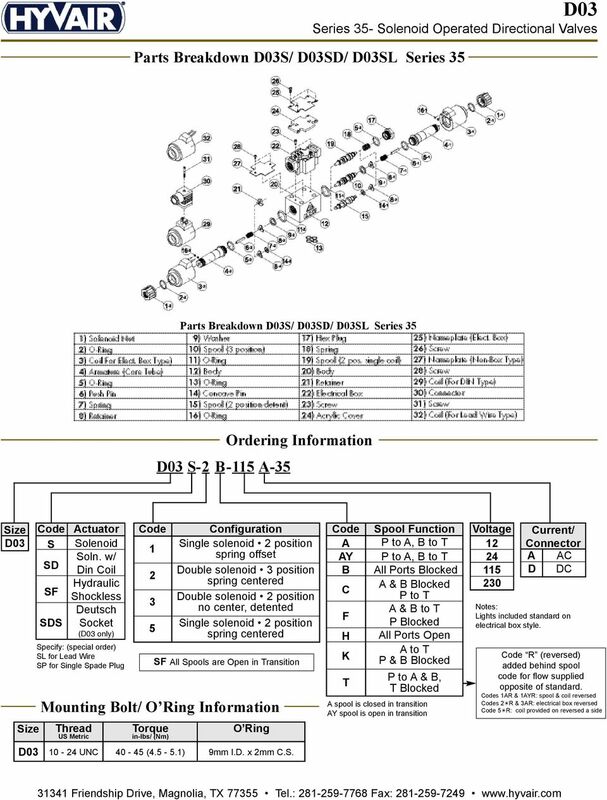 (Connectors may optionally be supplied with lights.) Deutsch socket and lead wire also available. Hydraulic/ Electric Shockless: Valve coils available electric shockless (rectified)- reducing voltages spikes, extending relay contact life, and providing even quieter operation. Spool shifting time is increased up to four times by metering the oil in the core tube. Option F (Electrical Box version only) Maintenance: Indicator lamps to diagnose connection; Plug-in coils provide easy changing without disturbing wiring. High Reliability: Valve designed to last 30 million spool shifts under proper use. Bolt Kit included with valve standard *Some spools rated less- check max. 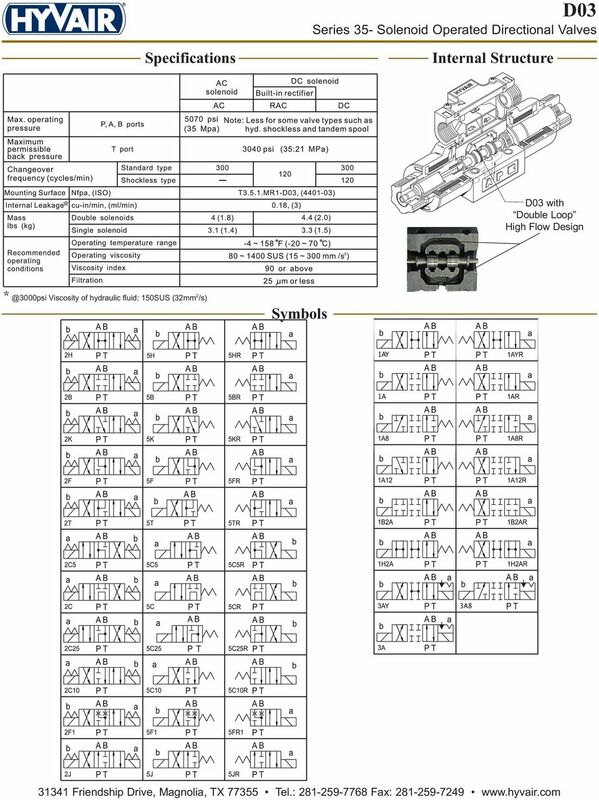 pressures and flows chart Specifications Series 35 High Flow/ High Pressure Directional Valves S Electrical Box Type SDS Deutsch Socket SD DIN Type SL Lead Wire Type Note: The maximum flow capacity is shown here. The maximum flow of each valve differs depending on pressure. 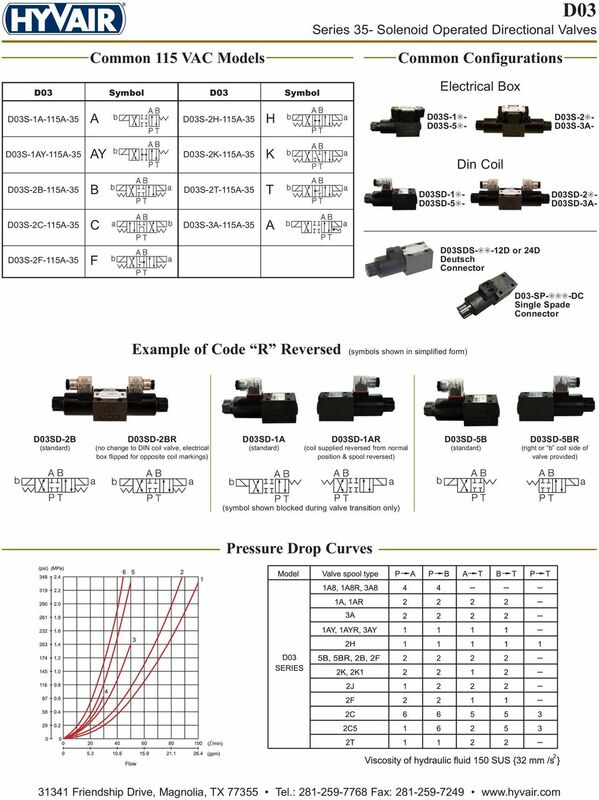 See HP (Pressure-Flow curve for each model. 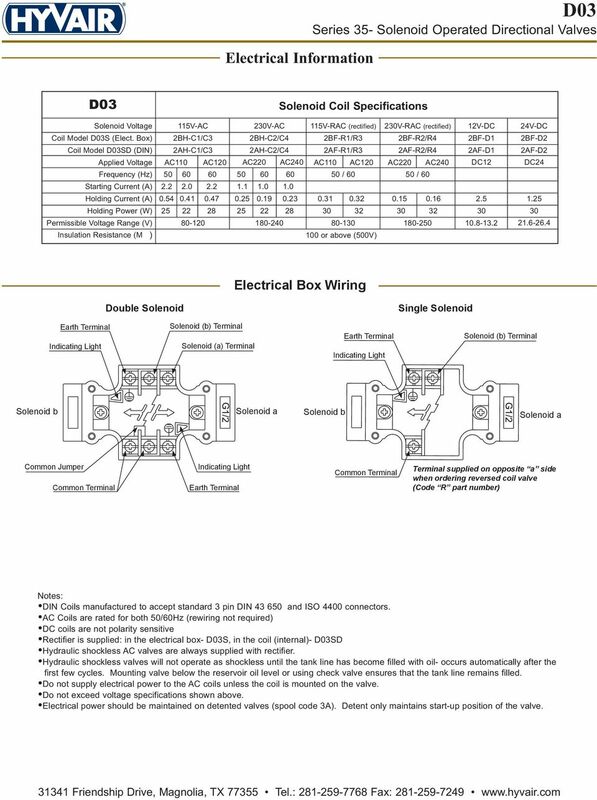 5 Electrical Information Solenoid Coil Specifications Solenoid Voltage Coil Model S (Elect. Box) Coil Model SD (DIN) Applied Voltage Frequency (Hz) Starting Current (A) Holding Current (A) Holding Power (W) Permissible Voltage Range (V) Insulation Resistance (M ) 115V-AC 2BH-C1/C3 2AH-C1/C3 AC110 AC V-AC 2BH-C2/C4 2AH-C2/C4 115V-RAC (rectified) 2BF-R1/R3 2AF-R1/R3 AC220 AC240 AC110 AC / or above (500V) 230V-RAC (rectified) 2BF-R2/R4 2AF-R2/R4 AC220 AC / V-DC 2BF-D1 2AF-D1 DC V-DC 2BF-D2 2AF-D2 DC Electrical Box Wiring Double Solenoid Single Solenoid Earth Terminal Indicating Light Solenoid (b) Terminal Solenoid (a) Terminal Earth Terminal Indicating Light Solenoid (b) Terminal Solenoid b Solenoid a Solenoid b Solenoid a Common Jumper Common Terminal Indicating Light Earth Terminal Common Terminal Terminal supplied on opposite a side when ordering reversed coil valve (Code R part number) Notes: DIN Coils manufactured to accept standard 3 pin DIN and ISO 4400 connectors. AC Coils are rated for both 50/60Hz (rewiring not required) DC coils are not polarity sensitive Rectifier is supplied: in the electrical box- S, in the coil (internal)- SD Hydraulic shockless AC valves are always supplied with rectifier. Hydraulic shockless valves will not operate as shockless until the tank line has become filled with oil- occurs automatically after the first few cycles. Mounting valve below the reservoir oil level or using check valve ensures that the tank line remains filled. Do not supply electrical power to the AC coils unless the coil is mounted on the valve. Do not exceed voltage specifications shown above. Electrical power should be maintained on detented valves (spool code 3A). Detent only maintains start-up position of the valve.